Watching the city council’s discussion Tuesday night of the proposal to change the name of Clemente Park on Middlesex Street to Pailin Park left me confused. That’s probably because many of the councilors themselves seemed confused about what was going on. The matter came before the council as a report from the Parks & Recreation Subcommittee which had met earlier that same evening. That subcommittee has Councilor Rita Mercier as its chair and Councilors John Leahy and Dave Conway as its members. Although the hour-long subcommittee meeting was televised, I only caught the last few minutes which did nothing to dispel the sense of confusion and indecision that continued on into the regular council meeting that immediately followed. Fortunately, City Clerk Michael Geary took comprehensive minutes of the subcommittee meeting (which are available online), so we are able to get a good sense of what occurred. At most council subcommittee meetings, the members make a motion to recommend certain action to the entire council. Most often, these subcommittee motions pass on a 3 to 0 vote; occasionally, there is a 2 to 1 split. But at this subcommittee meeting, it took the three members three tries until they came up with a motion that could even receive a second. First, Councilor Conway moved “to recommend to the Board of Parks to rename Roberto Clemente Park to Pailin Park.” Neither Councilor Mercier nor Councilor Leahy would second this motion, so it could not be acted upon. Next, Councilor Mercier made a motion “to request City Manager and Law Department provide a policy and process that can be done to name or rename City Parks in order to guide proper entities to honor those requests.” This motion also died when neither Councilor Leahy nor Councilor Conway would second it. Finally, as the clock reached 6:30pm and the subcommittee meeting had to end to let the city council meeting begin, Councilor Leahy moved “to refer the matter to the Board of Parks for their decision regarding change of name from Roberto Clemente Park to Pailin Park.” This was seconded by Councilor Mercier and all three subcommittee members voted for it. When this came up an hour later at the full city council meeting, the confusion among other councilors was caused by whether or not the subcommittee had endorsed the name change or merely kicked it down the road to let the Board of Parks make the decision without a recommendation of the city council. As detailed in Clerk Geary’s minutes of the full council meeting and in my own account of the meeting, those councilors who had not attended the subcommittee meeting were unclear on what exactly had been recommended. While some councilors, Conway in particular, stated accurately that the subcommittee had not made a recommendation, others obfuscated the subcommittee’s failure to act by diverting the discussion to their desire to have a set policy for such matters. Councilors Rodney Elliott and Vesna Nuon – the two main proponents on the council for renaming the park – both knew full well that the subcommittee had balked at recommending the renaming, but they both tempered their remarks out of a sense of diplomacy and strategic thinking, reasoning that to expressly criticize the subcommittee for failing to act would so alienate Councilors Mercier and Leahy that it would transform those two councilors into firm opponents of the proposal rather than their current posture of not wanting to take a stand on the issue. Some background: The park on Middlesex Street had been the site of a saw mill (powered by the adjacent Pawtucket Canal) during the 1800s. In 1907, the owner of the Lowell Tigers baseball team, Al Winn, constructed a state of the art privately-owned baseball stadium on the site which he then named Washington Field. The park was “state of the art” because it was one of the first in America with indoor plumbing and locker rooms for the players. The Tigers only played there for two seasons because Winn, though wealthy enough to build the stadium, was such an annoying person that the other league owners forced him to sell the team and then banned him from the league. (Winn still owned Washington Field but charged the new owners exorbitant rent so they moved the team across town to Spalding Field which we know today as Alumni Field on Rogers Street). Thereafter, the stadium was abandoned and fell into disrepair. The city of Lowell eventually tore down the stadium and took ownership of the land, dedicating it as a public park which they named Washington Park. 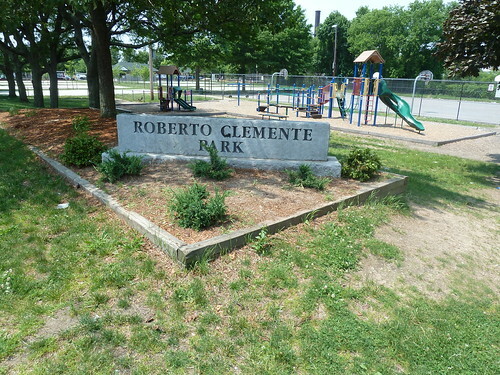 The place continued mostly as a field for youth baseball and adult softball leagues until 1973 when it was renamed Clemente Park in honor of Roberto Clemente, a fantastic outfielder for the Pittsburgh Pirates. Born in Puerto Rico, Clemente died when a plane he had chartered to bring relief supplies to Nicaragua after an earthquake crashed, killing all aboard. Although Clemente had no direct ties to Lowell (that I know of), he was a hero to most people of Latino descent in this hemisphere, particularly to those from Puerto Rico. The motion to rename the park was made by City Councilor Phil Shea. I recently asked Shea about the circumstances of the motion. He recalled filing the motion at the request of a priest from St. Patrick’s parish. The same council later appropriated funds for the installation of “arc lights” at the field which would enable adult softball leagues to play games at the park late into the evening. As the 1970s became the 1980s, adult softball waned in popularity and the neighborhood around Clemente field deteriorated and the park fell into disuse. Then, in one of those historical pivot points in Lowell’s history, thousands of refugees from Southeast Asia arrived in the city and settled mostly in the vicinity of Clemente Park. 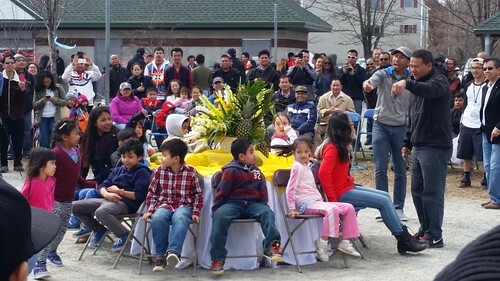 As Lowell’s Cambodian community grew and thrived, its members naturally congregated at this large greenspace in their midst and transformed the park and the neighborhood around it into one of the most vibrant places in the city. 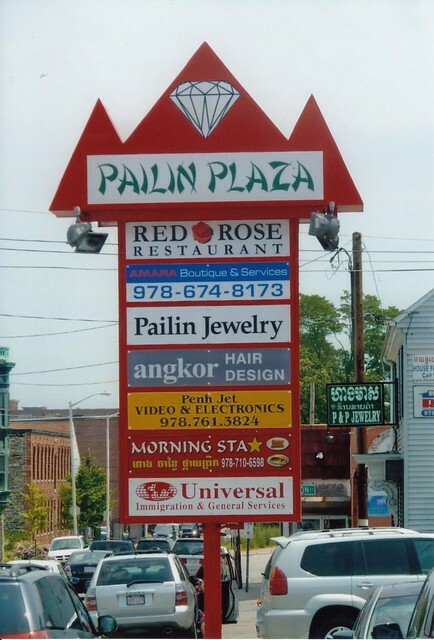 Seeking to create links between their new neighborhood and the homeland they were forced to flee, business owners named the vibrant shopping center across Middlesex Street from the park Pailin Plaza, for Pailin Province, a region of western Cambodia which was the home of many of Lowell’s residents. Because of the intensity of the Cambodian community’s use of the park, it was natural for the members of that community to desire to rebrand the park with a name associated with their Cambodian heritage. Perhaps five years ago, Councilor Rodney Elliott began exploring ways to rename the field Pailin Park. Councilor Vesna Nuon, both in concert with his colleague and independently, has sought the same objective. Both Elliott and Nuon, indeed all who have been involved in this effort, have proceeded with commendable tact and diplomacy to ensure that removing the Clemente name from the park would not be seen as a slight to the city’s Latino community. The effort made a great leap forward in 2016 when an opportunity to find a permanent home for Lowell’s Roberto Clemente Little League team arose. Previously, the Lowell team was transient, scrambling to obtain fields on a game-by-game basis to play home games against out-of-town teams. In December of 2016, Keith Rudy, the leader of the Acre Youth Organization, made it known that the AYO’s youth baseball program had become largely defunct as the youth of the neighborhood became interested in sports other than baseball. 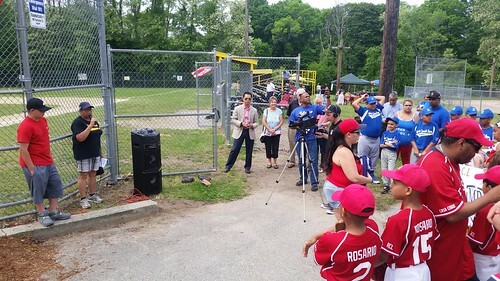 He said that the league had surplus baseball equipment that might be donated to the Roberto Clemente team, but also that the baseball field at Koumantzelis Park (adjacent to the Bartlett School in the Acre) would no longer be used by the AYO for little league baseball. 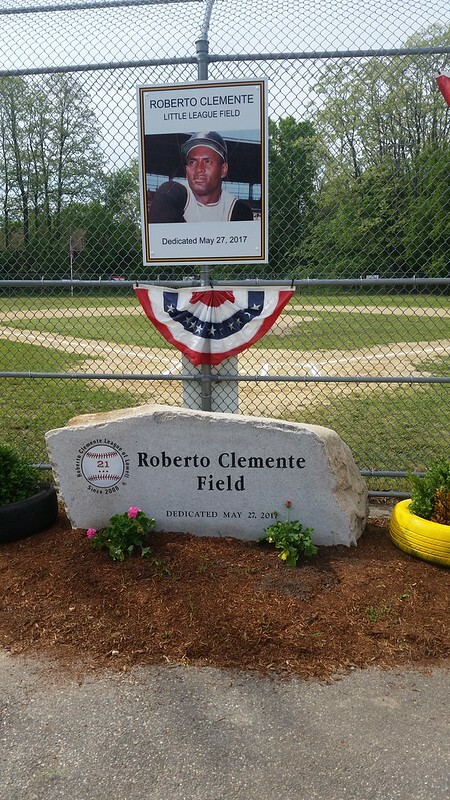 Under the leadership of Councilors Elliott and Nuon, the city proceeded step-by-step, always being inclusive, always being sensitive to the opinions of everyone with an interest in preserving the name of Roberto Clemente and continuing to honor his legacy. If there was anything else that could have been done, I don’t know what it would be. If forced to vote on the issue, I believe a majority of the councilors on Tuesday night would have endorsed the change of name. Instead, the majority deferred to Councilors Mercier and Leahy who, based on their comments at the subcommittee meeting, were not prepared to support the name change. It has always been up to the Board of Parks to make the decision. Presumably that decision would have been easier for the board to make with some guidance from the city council. Nevertheless, the Board of Parks is expected to vote on this matter this coming Wednesday, March 27, 2019, at 6pm in the Mayor’s Reception Room in City Hall. At the regular meeting of the City Council held Tuesday March 19, 2019 the following Motion was read and referred to the Board of Parks: Motion by C. Kennedy, seconded by C. Mercier to add following request to have Manager and Law Department develop a policy to name and rename parks in the City to the motion at the Parks & Recreation SC to refer to Board of Parks the request to change name of Roberto Clemente Park to Pailin Park. Adopted per Roll Call vote, 9 yeas. So voted. 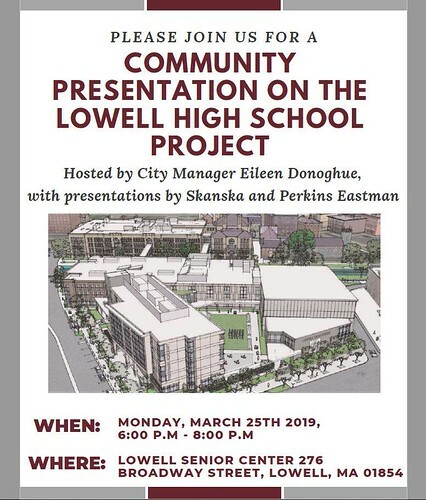 Monday – March 25, 2019 – Community Presentation on the Lowell High Project – 6pm to 8pm at Lowell Senior Center, 276 Broadway. Hosted by City Manager Eileen Donoghue with presentations by architects/consultants Skanska and Perkins Eastman. Tuesday – March 26, 2019 – Dan Kennedy on Return of the Moguls at 7pm at Lowell National Park Visitor Center, 246 Market Street. Media critic Dan Kennedy will speak about his book, Return of the Moguls, which suggests that the salvation of the daily newspaper may lie in the purchase of individual papers by wealthy individuals like Jeff Bezos (Washington Post) or John Henry (Boston Globe) which is a return to the original model of newspaper ownership the newspaper mogul. Part of the Moses Greeley Parker Lecture series. 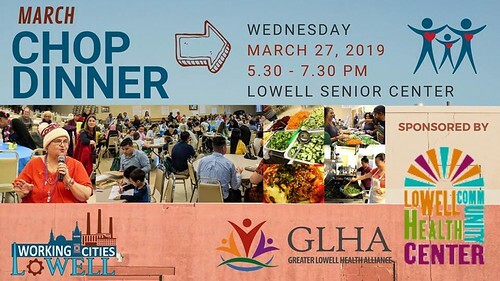 Wednesday – March 27, 2019 – CHOP Dinner from 5:30pm to 7pm at Lowell Senior Center. Lowell Working Cities will sponsor its (free) monthly CHOP dinner. Greater Lowell Health Alliance and the Lowell Community Health Center are sponsoring this event and will also be on hand to conduct a community health assessment. April 11, 2019 – Thursday – 14th Annual Take Back the Night rally. 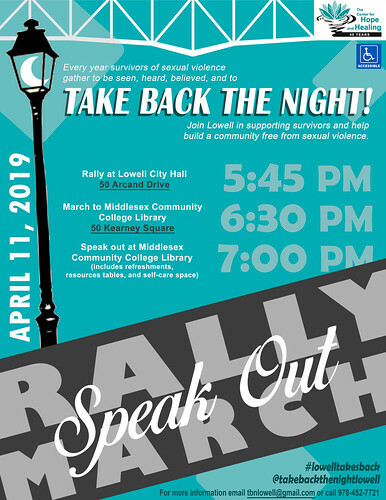 Begins at Lowell City Hall at 5:45 pm followed by a march to Middlesex Community College where a speaking program and gathering will be held in the college library at 50 Kearney Square. April 15, 2019 – Monday – Lowell Democratic City Committee quarterly meeting at 7pm at East End Club. State Senator Ed Kennedy will attend and report on the first few months of the current session. Also attending will be a representative of Compassion & Choices Massachusetts. Q&A will follow a presentation on the Death with Dignity legislation currently pending on Beacon Hill. May 18, 2019 – Saturday – 1pm to 3pm at Lowell Senior Center. Lowell Democratic City Committee Caucus to select delegates to attend the 2019 Massachusetts Democratic State Convention this fall.